My immediate thought was to get a suitable antenna and pre-amplifier to be able to receive my local D-ATV repeater, GB3GV. 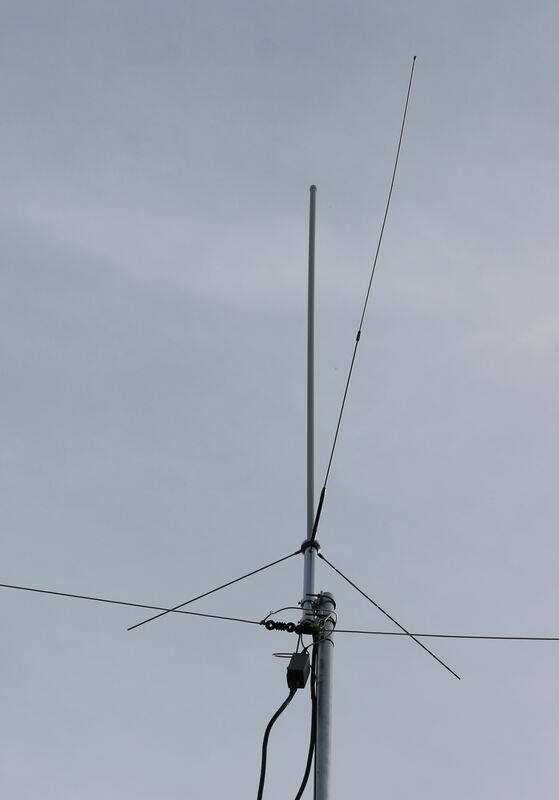 I purchased a 23 element 23cm Tonna yagi and a 23cm pre-amp and got those up on my mast. I hooked this up to an old DVB-S receiver that I had lying around and was immediately rewarded with a crystal-clear and stable picture from GB3GV. Now my focus would be on transmitting, little did I know that this would prove to be quite as difficult. Firstly, I had decided that I wanted to use professional grade equipment and (to me) this made sense as I already owned a large amount of SDI capable equipment, including a Blackmagic Design ATEM Production Studio 4K. This contains 4 x HD/SDI inputs and 4 x HDMI inputs and supports all resolutions from NTSC/PAL to 4K so would allow me to switch as many inputs as I was likely to need. Secondly, for the Leicester Tigers project, I had discovered the CasparCG graphics and video play-out software. This is professional grade software, designed by SVT (the Swedish national broadcaster) and used by them for all of their broadcast graphics. They released it as open-source software and with the addition of an SDI output card, allows the user to display various graphics and videos (including Flash and HTML templates) so I re-purposed an old Core2Duo based PC that I had lying around and with the addition of a Blackmagic DeckLink SDI card, created my video playout server. I had been searching on Ebay and various broadcast surplus websites for sometime and with the advent of the majority of broadcasters moving to HD, there seems to be a glut of standard definition ex-broadcast equipment available at the moment. Initially, it appeared that the majority of cheap modulators seemed to be 70Mhz IF only (no L-band output) so I managed to acquire (very cheaply) an NDS modulator and Divicom MV15 encoder. This would allow me to feed SD/SDI video into the encoder and that would produce an ASI transport stream which I could feed into the modulator. In theory, all that I would then need was an upconverter to convert the 70-160Mhz IF to a suitable frequency for D-ATV ( or so I thought!). I discovered what looked like a suitable unit from Hristiyan, LZ5HP. After some discussion with him, I decided to order the transverter. I had hoped that after removing the internal attenuator, the output of the modulator would be able to drive it to around 2w which would hopefully allow me to reach my local D-ATV repeater, GB3GV. Everything arrived and I began to hook it all up. The first problem was that I didn't appear to be getting a valid ASI transport stream out of the encoder. After much head scratching, I decided to see if I could find something that would let me analyse the ASI output. A quick search on Ebay revealed auction for a DekTec DTA-140 which is an ASI input/output card. The current bid was 99p so I thought I would put a £10 bid on it. I won the auction for £9.50 so not bad. When the DekTek card arrived, I installed in in a spare PCI slot in my CasparCG server and downloaded StreamXpert from the DekTek website. I discovered that although there was a valid stream being generated by the encoder, it didn't contain a valid video PID. This was a fairly simple fix of reducing the encoded video rate to around 3.3M. It was then generating a valid stream that I was able to watch in StreamXpert, success??? 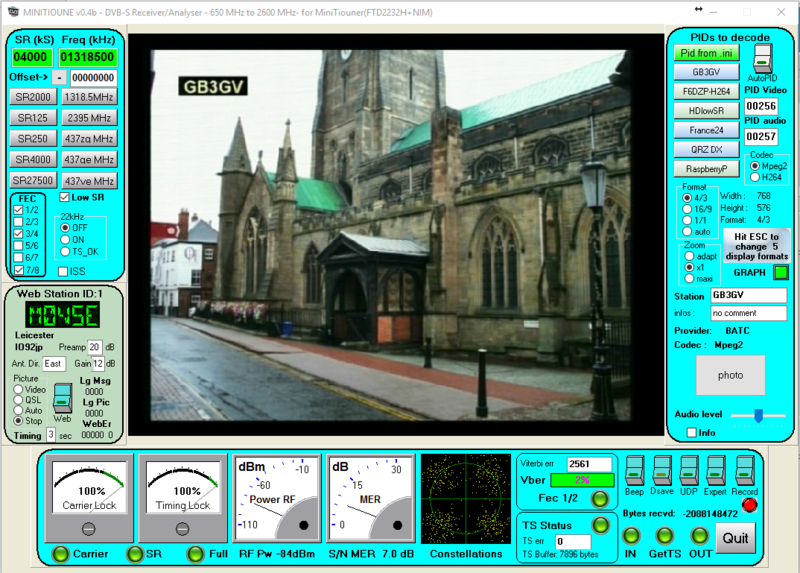 I hooked-up the modulator and transverter and was able to see that I was transmitting on the correct frequency via a simple USB SDR receiver (SDRplay) but whilst viewing the GB3GV stream available on the batc.tv website, my pictures never appeared. Was this the end of my D-ATV experiment? Obviously not, I was going to keep buying stuff until I got it to work! I decided that the problem may be the IF output/transverter interface (probably wrongly as it turned out) so I decided to get a modulator with an L-band output. This would allow me to generate a suitable signal directly without needing the transverter. I ordered an SED Starcast DVB-S modulator with L-band output and and Antennair DTX-A23 which should between them give me about 2w out. The SED modulator also had the added benefit of a web based configuration interface and I could hook-it up to my 10Mhz GPSDO for excellent frequency stability. I was now able to get a picture on my DVB-S receiver using the direct output of the modulator but when hooked-up to the amp, GB3GV still didn't seem to be receiving my picture. Not allowing this apparent failure to dampen my enthusiasm, I discovered that the problem may be due to the Video/Audio PIDs being generated by the Divicom modulator as I was advised that GB3GV would only accept a Video PID of 256 and an Audio PID of 257. After much research, I realised that there was no way to change the PIDs in this particular modulator as they are programmed in the factory so I opened my wallet (again) and purchased a Tandberg E5611 encoder. Initially I was concerned because there seemed to be no way to configure the PIDs but after a bit of research on the BATC reflector, it transpired that this can be configured via the RS-232 port. I hooked this up and was able to access the menu. 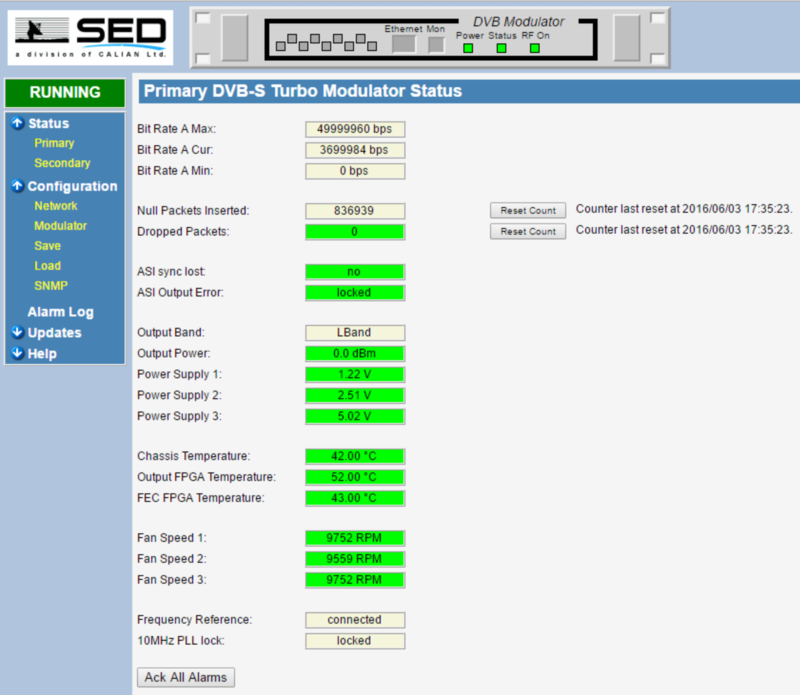 This allows you to configure much more than the PIDs but I left most of the configuration options at default! Unfortunately, after setting the PID details as recommended by the BATC and hooking everything up, I still wasn't able to get a picture transmitted to GB3GV. I noticed that my DTX-A23 amplifier appeared to no longer be getting warm so suspect that it may have died? I am now re-grouping and will hopefully have an answer soon? I'm not sure if it is an answer but I have now ordered a small (1mw to 3w) linear from Bert, PE1RKI. Hopefully this will arrive soon and I will post an update when it does and I have (hopefully) got on air with D-ATV. Well the amplifier arrived from Bert and firstly, I must say, what a work of art! The case is milled out of a block of solid aluminium and mounted to a very substantial heat-sink with a pair of fans mounted to it. (I will take a picture soon). I have connected it all up and I achieved some success. 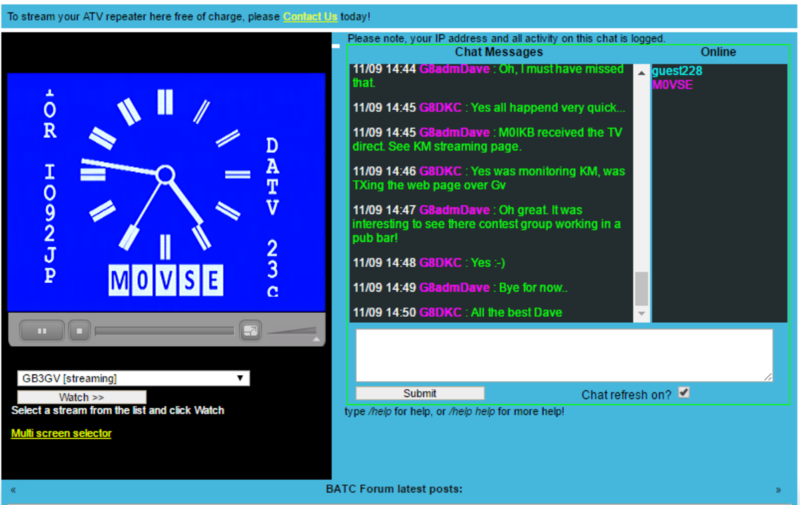 When looking at the GB3GV stream on the batc.tv website, my picture appears for a second and then disappears! I'm not sure if this is a setting or something else so I will need to do some more research? So after speaking to the repeater keeper (Nigel M1NAS) of GB3GV, it appears that the repeater WAS de-sensing itself. Once he had adjusted the filters, I was able to acces it immediately so it looks like I had it all setup OK after all... Of course I don't know whether it would have worked with the old encoder/modulator/transverter that I tried before but I am less concerned about that and at least I have a 23cm transverter if I want to play with 23cm SSB! I have also been playing with Minitiouner and Minitioune software, it is a USB DVB-S decoder that provides excellent diagnostics information, much better than the signal strength and quality that most DVB-S receivers provide.